50s Twist and Shout dress Navy Pushing Daisies from Trollied Dolly. The 'Show-Stopper' ...the 'Jaw-dropper' of the Trollied Dolly Spring / Summer collection! Featuring all those delightful ditzy dolly details you can expect from this label. 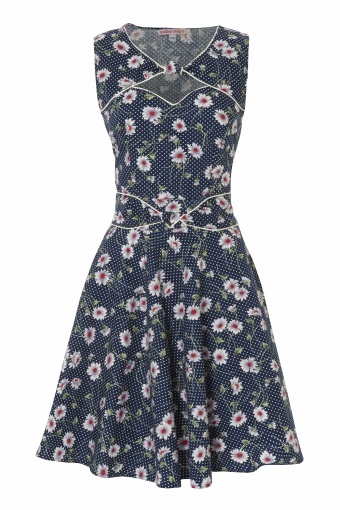 Great 50s inspired shape dress in vintage cute daisy print in navy blue and sweetheart peephole neckline. With the ties around the back you can nip in the waist an be sure that all the attention is on your best assets! The dress has elastic around the back for fabulous fit. If this cutie doesn't give you something to 'Twist 'n Shout' about, we'll kick off our blue suede shoes and eat our hats! Accessories: Hairflower Heartbreaker: shoes Pin up Wedgeheel Tootsie red. Pictures by Sjurlie Photography.